If you recall, last year we posted exclusive gameplay video footage of WET that we took at MIGS 2008. At the time, Montreal based developer Artificial Mind & Movement (A2M) did not have a publisher for their game (their initial partnership with Activision didn't work out) and so the only thing one could expect for WET was nothing more than a showcase piece longing for some publisher love. Well, since then a lot has happened. Bethesda came along and picked up the game. As a result, A2M saw all of their hard work and ambitions come to life on retail shelves across the world. As gamers waited for this game to be released, they commented on comparisons to games such as Max Payne and Stranglehold as well as visual cues akin to the grindhouse genre. The latter description holds true, however comparisons to Max Payne and Stranglehold aren’t completely justified. In fact, after playing the game, I kept thinking a cross between Lara Croft, The Matrix and grindhouse movies. So allow me to tell you what WET is. It’s a game that does many things well. It’s a very stylistic game that does a good job of incorporating fun and engaging gameplay with some solid voice acting and a great soundtrack. Rubi is the heroine and she’s a looker with a mean streak. 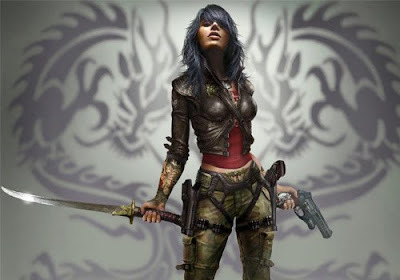 To compliment her badass-ness, she has at her disposal an arsenal of very effective weaponry including pistols, shotguns, crossbows and a lethal sword. As I mentioned before, the gameplay is extremely fun due to the well balanced combat cocktail of “bullet time” slow mo gunplay and athletic acrobatics. Take it a step further to string together moves and you can execute combos (all in slow motion). The end result is a highly satisfying and visually attractive shoot em’ up that will have your eyes drooling. It's also very helpful that the overall control scheme is simple in execution and layout so that all of your focus in on the screen where it should be. As you take out the bad guys, it’s essential to do so efficiently and in continuous fashion. During any shoot up sequence with enemies, you can build up your score multiplier by stringing together one kill after another. You’ll want to build it up as high as possible and maintain it for as long as possible so that you can rack up style points. This in turn can then be used to upgrade Rubi’s abilities and weapons. Throughout the game you will also come across a regular dose of quick time button sequences where you have to respond in time to and press the corresponding controller button that flashes on the screen. Nothing unique overall, but does add another dimension to the game. Amongst all of the good WET brings to the table, I did have some minor knocks. For one, while the game can be addictively fun, I felt it was too linear. Yes, granted these types of game need to be linear in nature, there certainly could have been some elements of free roaming to make things more interesting. Additionally, the game’s difficulty could also have been a notch higher. Especially boss battles. The few that were in the game proved a bit too easy to conquer, especially at the end of the game which kinda made it anti-climactic. At the end of the day, WET is a solid game. A2M has put together a good package that is entertaining and has some great visuals. But as well as it executes on many aspects, it does lack some polish that holds it back from being an even better game. All that said, I’d recommend taking the game for a spin as you’ll likely have one enjoyable ride.